I've lived most of my life in the Boston suburb of Lexington, so I can say firmly that it is somewhat of a culinary wasteland. There's plenty of pizza and Asian (which only recently got any traction with Formosa Taipei - but then, that's another post). And besides one of my favorite bakeries, there wasn't anything in town that I've felt deserved much attention. Until now, at least. A few months ago, Vine Brook Tavern opened right in the center of town, and I feel like I've found my local watering hole AND a place I can firmly recommend to friends and guests. I've been a few times already, each in very different circumstances (once for a drink and appetizers, once for a more casual family-like dinner, and once for a finer evening out), and I've only seen the quality of everything improve over time. The building, which has housed a few Italian chain restaurants in it's last few iterations, has been cleaned up a lot, and it really fits in with the historical look of the town now. I'd call the design contemporary colonial, with lots of wood and iron and muted colors. And yet, it still feels inviting! The only thing missing is a fireplace to have a drink next to. First off: the drinks. There is some fine cocktail work happening here! The fig sidecar (with fig-infused Bulleit bourbon) is something I dream of, and the Bee's Knees is perfectly sweet. And these drinks aren't wimpy, either! My favorite appetizer at Vine Brook is the lobster tacos (one for $4 or three for $12), but they are sadly not on the menu right now (they've been replaced by steak tacos). Hopefully they'll come back soon, because a couple of those and a drink at the bar would make me a happy girl any day. 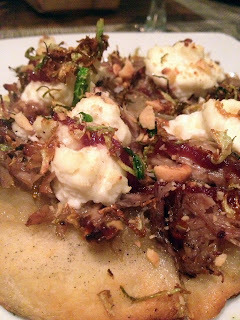 Coming in a close second, however, is the duck confit pizzetta (above, $9) - roughly 6 inches in diameter, the little pizza is loaded with duck confit, crispy caramelized onions, fresh ricotta, and little pieces of hazelnut. Plus, the crust is crispy on the bottom - a tough thing to do with all those toppings! 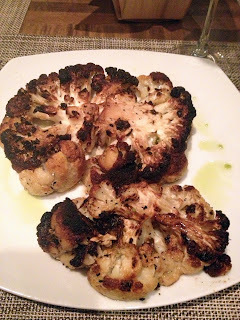 Another appetizer you have to try: the cauliflower steak ($8). Personally, I love cauliflower and would eat it any day of the week, but I know most people aren't quite so excited by it. Even our waiter said he wasn't a fan of cauliflower, but he strongly recommended we try this dish. It's a wonderful presentation of crispy roasted cauliflower with plenty of garlic and capers. I love the idea of starting a meal not with a salad, but with a cooked veggie! The entrees are equally delicious and hearty. My steak frites ($23, which I ordered with sweet potato fries instead of regular, and you should too) were perfectly cooked, and the fries were tossed with arugula, parmesan, and garlic, which wilted the greens slightly. Oh so good! The roasted salmon ($22) was also clearly cooked with expertise and was served with crispy root veggies and a bright beet sauce. I didn't have high hopes for dessert, which was OK , because I was plenty full. 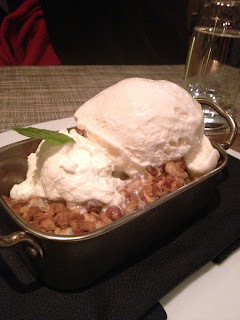 But when our order of apple and pear crisp came out, piping hot, with a pile of melty vanilla ice cream on top, I suddenly found myself willing to eat some more. The fruit was still chunky, not cooked down to mush, and the topping was loaded with oats and was nice and crunchy. What a way to end a meal! Like I said, I am so happy to have a place like Vine Brook Tavern open in my hometown. We sorely needed something of this quality, and I know I'll be back. Chef Chris Frothingham (who has previously worked at Sel de la Terre, Bonfire, and Kingfish Hall) is doing great stuff with fresh and seasonal items while maintaining a varied menu that can appeal to a wide variety of diners. I can't wait to see what he comes up with when all the local produce comes in during the summer! Full disclosure note: one of my three visits was paid for by the restaurant. This place sounds great! We venture out to Lexington often, so we will have to give this place a try the next time we're in town. E HAVE BEEN SEVEARL TIMES , INCLUDING THEIR AMAZING SUNDAY BRUNCH!!! MY FAVORITE APPETIZER IS THE PORK SHANKS AND THEIR HUMMUS WITH GARLIC AND SHRIMNP ON TOP!!!! WE ALSO LOVE THE STEAK FRITES, AND THEIR VEAL MEATLOAF IS DELICIOUS... YOU WILL NOT BE DISAPPOINTED! Yes, love Vine Brook Tavern!! Their calamari app is to die for too. Michelle Collins... come to Lexington for some grub (and wine) and let's catch up! Yes, Vine Brook has great food, but after eating there 4 or 5 times (dinner, Sunday brunch, AND drinks/apps), not once did we escape service problems. We've been served doubles of apps (when we ordered just one) and even though we sent them back (the server admitted the mistake), we were charged for them and had to get a revised bill. We had a three course meal take more than 2 1/2 hours on a Thursday night. We were told that an item was available that night (prime rib), then the waitress came back THIRTY MINUTES later to tell me, oops! sold out!--which delayed my entree even longer. So the upshot is--fine food (no question there, and that apple crisp is to die for), but someone needs to get the front of the house in order, PLEASE. At these prices, the service should match the food. Thanks, this is very informative. I admire the time and effort you put into your well-detailed nice blog. I hope to see more of your write ups. Keep it up!!! UrBackYard.com is your passport to the best restaurants in Boston boston dining deals.